How to write a letter to change the research topic to the head of the department? Please help me in this regard. Letter to Change Phd Research Topic and M.Phil Research Topic or any business related research. I am requesting a change in the M.Phil research topic. I realize the deadline has passed, but please do consider my request. Despite searching everywhere, on the web and in the library, I am unable to find sufficient information to conduct meaningful research. I am available for a meeting on campus, whenever it works best for you. I’m writing this to let you know that I have been assigned to do research work on the’’ Noise Pollution’’ to complete my final assessment which is due in the coming month. I have no issues with the topic, however I was deeply interested to do a research in Child Abuse for which I have spent at least three months to collect and organize data from various resources. Hence, I would like to request to change my topic accordingly so that I can continue to finalize the assignment which will be more comprehensive than the allotted one. Anticipating a quick and positive response. It is to request you that I am an M.Phil. Scholar and my final semester are going to end within 3 months. The final project has been allotted to all of us. The topic which was allotted to me for my thesis is Quantum Analysis for Physical variables. I have researched a lot but I could not be able to find any relevant data to my topic from anywhere. You are requested to change my thesis topic so that I might be able to collect data for my topic and complete my research efficiently within due time. I shall be grateful to you for this kindness. 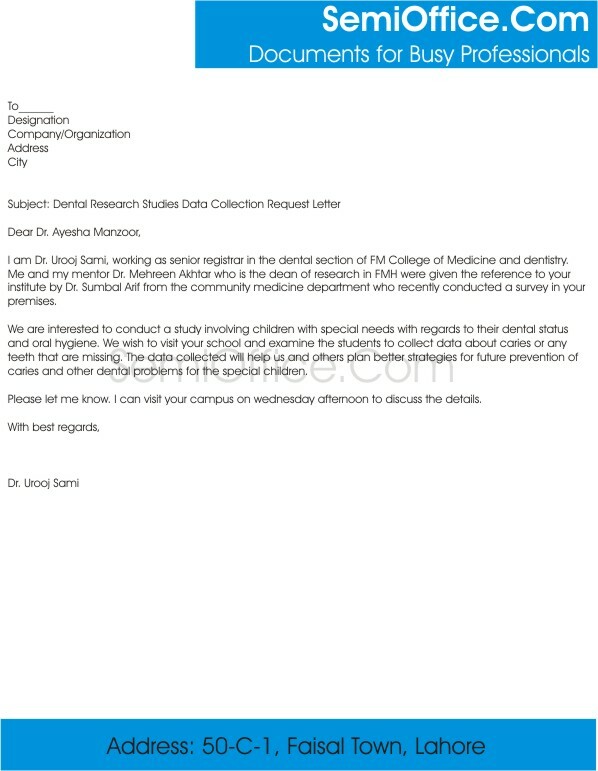 Sample request letter for data collection by university students for research projects of medical field. This request letter for data collection is issued by the University Registrar for the students to collection data from a social work organization. I am Dr. Urooj Sami, working as senior registrar in the dental section of FM College of Medicine and dentistry. Me and my mentor Dr. Mehreen Akhtar who is the dean of research in FMH were given the reference to your institute by Dr. Sumbal Arif from the community medicine department who recently conducted a survey in your premises. We are interested to conduct a study involving children with special needs with regards to their dental status and oral hygiene. We wish to visit your school and examine the students to collect data about caries or any teeth that are missing. The data collected will help us and others plan better strategies for future prevention of caries and other dental problems for the special children. Please let me know. I can visit your campus on Wednesday afternoon to discuss the details. Thank you very much for your email dated 10th June XXXX. Somehow, I received your email today. I am sorry the institute is closed for summer vacations w.e.f. 1.6.XXXX. However the institute will re-open for Summer Internship Program from 1.7.XXXX to 18.6.XXXX. Majority of our students will be present. We may plan your activity during this period after proper program agreed. Thank you for your kind reply. We will be able to arrange the camp on the dates mentioned by you. I wish to schedule a meeting with you this week or early next week and I can explain everything and discuss any concerns you may have. I am sorry about the confusions, but i was traveling out of Lahore and away from computer. I am back sooner than anticipated and I will come for a meeting Tomorrow, Wednesday at 10 Am. Again my apologies for any misunderstanding and rescheduling. Sample letter of data collection for research work in college and university by the authorities of college and university. Sample recommendation application for information collection about the special students for research projects of university students. This is to certify that Mr./Ms.___________ is a bonafied student of MS Health Psychology, LCWU. He/She is conducting a research entitled “The Relationship Between Perceived Stress and Coping Strategies among Parents of Autistic Children” under the supervision of Mr./Ms._______ lecturer LCWU. She needs to collect data from your organization, your cooperation will be highly appreciated. It is to request you that John, William, Smith and Snow are the student of the University of the Chicago working on traffic analysis on Golden Gate Bridge. These four students will come to you on 15th of June, 2016. Since the research work which they are doing holds a valuable importance to the university and the government as well so you are kindly requested to allow them with the information they need. They are in need of only general survey related information. After their work you are welcome to preview this research anytime you want. I assure you that there will be no misuse of this information and the source of this information will be kept concealed. We will be responsible for any misuse of this information. I hope that in light of above mentioned events you will allow the group of four students to have this information. I shall be very thankful to you for this kind favor. I am a student at Lahore University of Management Sciences and I am writing to you in regard to my 1502 Organizational Behavior (ORSC 201) project. I was an intern at AHF in 2016 in Speech Therapy Department and the experience left a long lasting impression on me. Your organization with international collaborations and recognized practices has further compelled me to write to you. I wish to study how AHF’s founders’ personal traits have a trickle down effect on the organizational culture and values and how the culture and values upheld by the institution contributed to the overall success of AHF. I request you to extend help to my group of four members so we can visit AHF. We would like to conduct surveys and interviews with AHF staff and request one interview with President and Vice President as well. I shall be highly grateful for your support and cooperation. I am conducting a research study to look at “Level of implementation of Green Supply Chain Management Practices in Pakistani Organizations” as part of my MS-SCM project and need the views of experienced “Supply Chain/ Procurement/ Production/ Quality” managers. For this purpose I require your help for getting responses of relevant persons from your contacts. Thanks a lot for your co-operation. Hope you are doing well. I am Maleha from Lahore University of Management Sciences. I am a 3rd year student doing Bachelors in Management Sciences. I am currently taking a course on Non Profit/Voluntary Organizations in which we are supposed to pick one NGO and analyze it on various dimensions. Sample job application for research assistant or analyst job in bank, investment company or any other company. This letter can be used for any post of research assistant, research officer, researcher, analyst, manger data analyst, assistant analyst, officer analyst or research analyst. With due respect, availing this dignified opportunity, I would like to give a brief of myself. I have Master degree in statistics . I shall practically explain my capabilities and suitability if the chance is given. I shall always be ready to accept new challenges and possess the qualities to work under stress to meet the deadlines. For further details, kindly find enclosed herewith my CV/Documents for your kind pursuance. I have found out through reliable sources that a post of research assistant is vacant in your organization. I offer my services for this post. I have done MSc (Chemistry) from California University and also gained practical experience as a research assistant at Forex chemicals for two years. I am an energetic and hardworking individual and I am well versed in basic chemical processes and research techniques. If given chance, I am confident that I would add value to your organization. Please find attached with this application, my resume and previous experience certificates. Kindly, consider me for this job as I desperately need one to sponsor my future studies. I shall be highly grateful.